UPDATE 2 4-3-2013: TALKING OUT BOTH SIDES OF THEIR MOUTH? Exxon-Mobil is telling the media this is Crude Oil, but telling the government it is Not Crude Oil. Why would they do that? See below. like most other Dilbit spills. Is it a harmless error? Maybe. Dilbit LOOKS LIKE CRUDETo an Oil Executive, Dilbit shares many properties of Crude Oil. It is a broad-spectrum mixture of many types of hydrocarbon molecules. to the heaviest pitch, asphalt, tar, bitumen. They may *think* about it like crude oil. But it is not crude oil. Dilbit (Diluted Bitumen) is a kind of synthetic crude oil, with lots of lighter hydrocarbon solvents added, which is necessary to transport it in a pipeline. 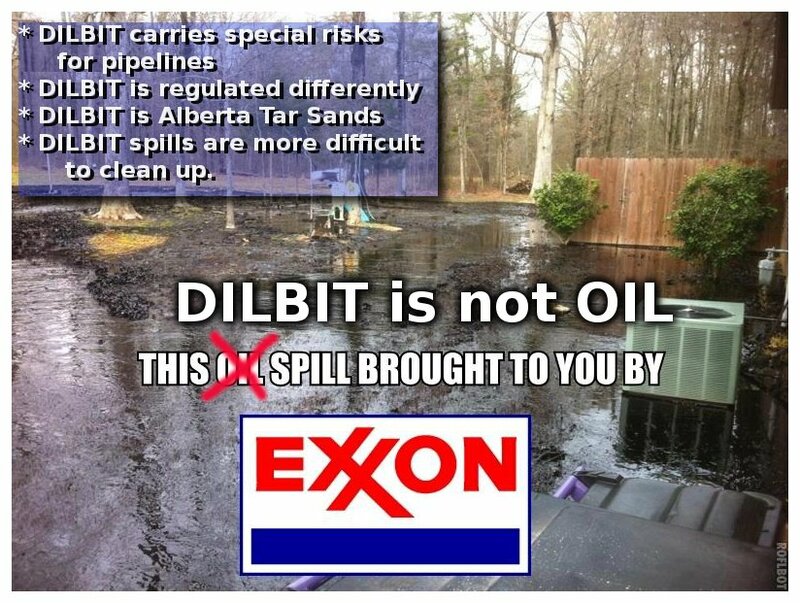 Or, is the media calling Dilbit "Crude Oil" a deliberate coverup? 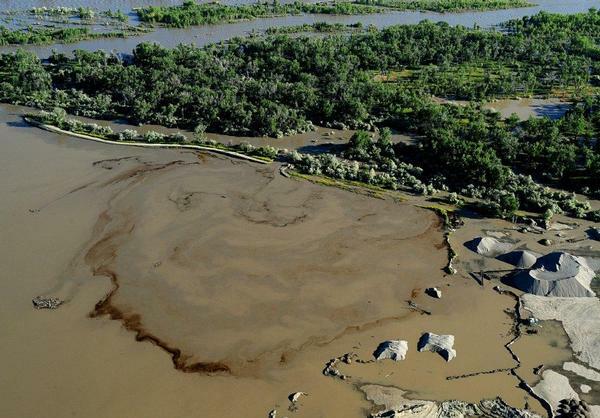 ... to keep the public from understanding A) that this "oil" is really from Alberta Tar Sands? 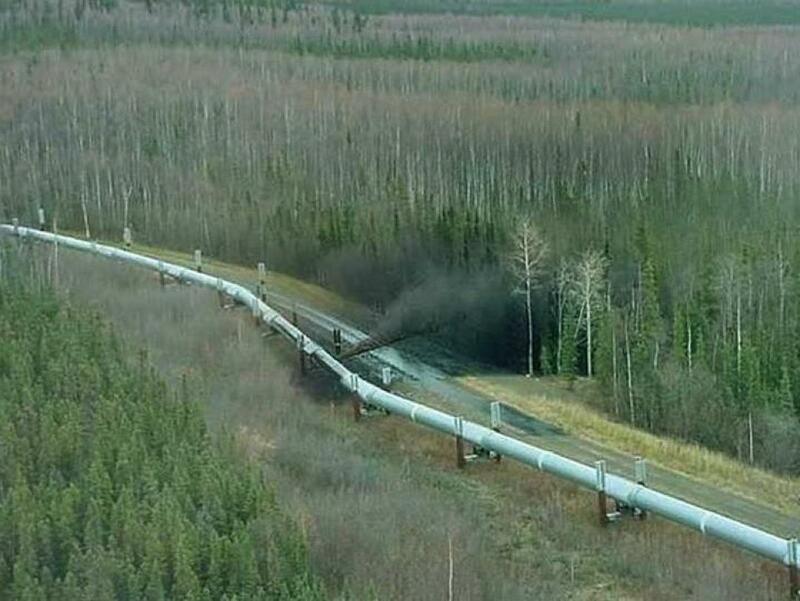 or b) To keep the public from understanding the unique hazards of Dilbit Pipelines? and c) cleanup of spills? This ruptured 20-inch pipeline runs 858 miles from Patoka, Ill. to Nederland, Texas, and is called by several names, "Pegasus", "Exxon Patoka - Corsicana" (NPMS/PHMSA) , and also by the partnership which operates it: Mobil Pipe Line Company (MPLCO). NOTE: part of the problem with emergency response is these pipelines often have several different names. 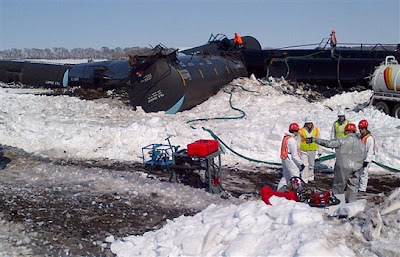 Many of the mainstream media are calling this a "crude oil spill", however this is somewhat of a misnomer. It should properly be called Dilbit. Dilbit is a kind of synthetic crude. This is a very important distinction for the press to get correct for several reasons. While DILBIT (Diluted Bitumen) is a complex mix of hydrocarbons, similar to crude oil, the basic component is Bitumen, which is more like coal or pitch than like oil. They have to dilute it with all kinds of other lighter hydrocarbon solvents to transport it in a pipeline. You can even see the chunky nature of the Dilbit... this is not ordinary crude oil. Dilbit has special risks when transported in pipelines. Let's hope the mainstream media starts reporting this correctly, as a DILBIT spill. c) they have different safety concerns. For example, due to the high viscosity (and specific gravity) of dilbit, shipping it in a pipeline requires higher pressure and higher heat than ordinary crude oil. This makes DILBIT PIPELINES especially subject to cavitation, friction, fluid hammer, and piezoelectric effects, which can produce vibrations, resonances, shock, explosions, and weld failures and pipeline ruptures. 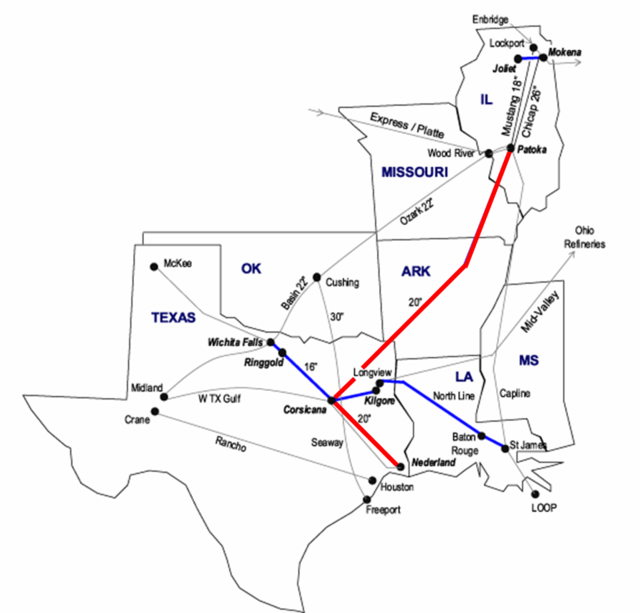 Map detail showing route of the "Pegasus" line, also called the "Exxon Patoka - Corsicana line (NPMS/PHMSA) , and also by the partnership which operates it: the Mobil Pipe Line Company (MPLCO) line. HOUSTON--(BUSINESS WIRE)--April 20, 2006--Mobil Pipe Line Company (MPLCO), an affiliate of ExxonMobil Pipeline Company, has started delivering Canadian crude to the U.S. Gulf Coast through an 858-mile crude oil pipeline that runs from Patoka, Illinois to Nederland, Texas. Deliveries to Beaumont, Texas-area refineries began in early April. A first for the U.S. Gulf Coast region and Canadian crude producers, the successful completion of the 20-inch Pipeline Reversal Project gives shippers of western Canadian crude oil direct pipeline access to U.S. Gulf Coast refining markets. It also allows MPLCO to optimize a previously under-utilized pipeline to best advantage. Mike Tudor, president of ExxonMobil Pipeline Company, said, "The 20-inch Pipeline Reversal Project is a win-win for the people of the Gulf Coast and Canada, the crude producers, refiners and ExxonMobil Pipeline. It is also an excellent example of our efforts to maximize the value of our pipeline and terminal assets. Canadian shippers have committed an average volume of 50,000 barrels per day for the next five years, and, in light of the high shipper interest, we anticipate that the pipeline will operate on average near its estimated capacity of 66,000 barrels per day in heavy crude service." "The project team, from our Business Development group's work with Canadian producers to the engineering and operations activities in the field, did an exemplary job in implementing a project with a unique and valuable niche in the marketplace. The team worked over 240,000 hours, many in challenging winter conditions, without a recordable safety incident and we commend them for their utmost commitment to safety," he added. 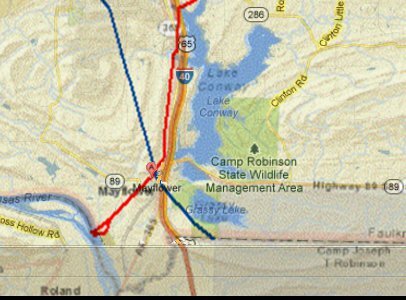 The project reversed a 20-inch, 858-mile MPLCO crude oil pipeline that had historically run south-to-north from Nederland, Texas, to Patoka, Illinois. The 648-mile segment from Patoka to Corsicana, Texas, had been idle for several years, while the 210-mile segment from Corsicana to Nederland had been moving predominantly foreign crude north to markets in North Texas and Oklahoma. The project has also enhanced synergies with Mustang Pipe Line Partners, a joint venture in which MPLCO has a 70% ownership share. 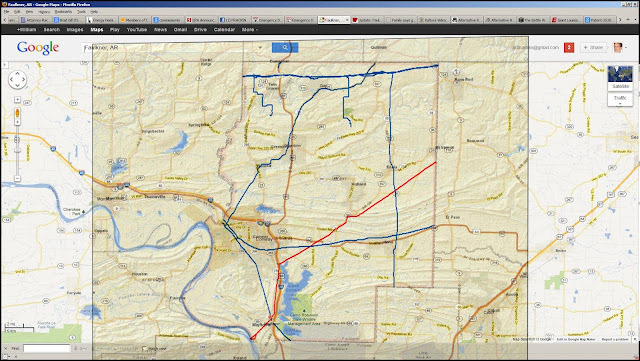 Mustang operates a crude pipeline that extends from the Chicago area to Patoka, which allows access to other pipeline systems further north. Detail. Marker A is site of spill. The blue pipeline is natural gas. The red pipeline is the one that ruptured, called variously, the "Pegasus", "Exxon Patoka - Corsicana", or the MPLCO. This is the Northwood subdivision near Starlite Rd. North. Notice the pipeline runs right under some houses in the upper left of the subdivision. Is the Oil+Gas industry deliberately trying to mislead the public and the government by referring to dilbit spills as "Crude Oil"? 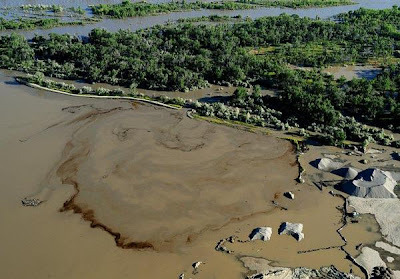 Alberta Red Deer River Dilbit spill June 2012 widely reported to be "Crude oil" over "dilbit" by 10:1 (by using Google matches as a guide). 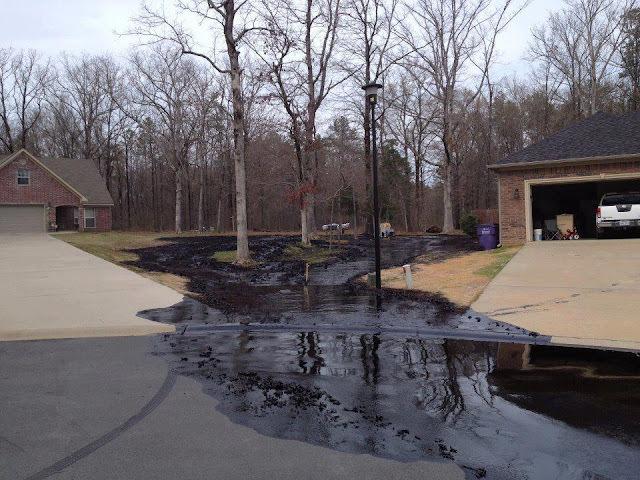 Mayflower Arkansas DILBIT spill called "crude oil" by the mainstream news over the correct term by 1:000 : 1. Notice the trend. 4:1, 10:1, 1000:1. Media is getting it wrong more often. Hmmm... Intentional media/corporate coverup? YOU BETCHA! UPDATE 4/2/2013 -- Just found the history of this pipeline. It's 66 years old, built in 1947. Seems like the Maximum Allowable Operating Pressure was 800 psi. Dilbit typically requires 1300-1440 psi, which is around 160-175% the design pressure. This line was to supply about 250.000 barrels per day. It was to service the Lubrite Refinery in E. St. Louis. The Strawberry station was automated in 1962 and operated remotely from Dallas. It has a single 900 hp electric motor turning a centrefugal pump and producing an output pressure of from 600-800 psi. Dilbit pipelines typically run at 1300-1440 psi. That's around 160-175% the design pressure. No wonder the thing ruptured. They basically took and old pipeline which used to ship crude from Texas to Illinois, and reversed the direction in 2006 after it had sat ideal "for a few years". UPDATE 4/3/2013 -- TALKING OUT BOTH SIDES OF THEIR MOUTH? 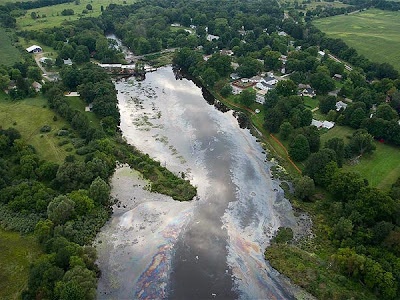 While 99.5% of the media is repeating what they are being told by Exxon Mobil, that this is a "crude oil spill", the same Exxon Mobil is telling the government the truth, that this is DILBIT, thus exempting them from paying into a fund for the cleanup. "Exxon Mobil increased the capacity of its 1,381-kilometre Pegasus Pipeline by 50% to about 96,000 barrels a day, the Irving, Tex.-based company said Wednesday in a statement." Yet, yesterday Inside Climate News reports: "....the agency ordered pressure in the pipeline to be reduced to 656 pounds per square inch once operations are allowed to resume, just 80 percent of the operating pressure of 708 psi moments before the rupture. At the time of the reversal, the pipe was tested at 820 psi." does not add up to an operating pressure of 708 psi. I want to especially thank my friend Leland Snyder for helping me understand chemistry better. Any errors or omissions are mine alone!! Great explanation here - thanks so much. You ask how the pipeline capacity is increased. It is increased by adding more pumping stations. Pipeline capacity is increased by adding pumping stations. Mobil Pipeline Co added 5 new pumping stations as part of the capacity upgrade project. This doesn't necessarily increase total operating pressure, it just helps prevent pressure drop offs along the line.